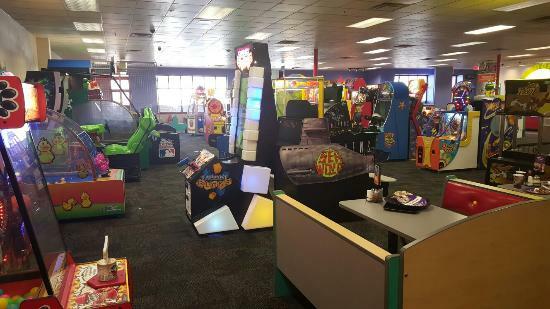 There aren't enough food, service, value or atmosphere ratings for Chuck E Cheese's, New Mexico yet. Be one of the first to write a review! We got a large take-out sausage and mushroom pizza. Cooked to perfection and no skimping on toppings. Unless you like tons of noisy kids, order to go! The while family had a good time. Its a bit pricey but as long as the kids had fun that is all that matters. It's been years since visiting a Chuck E Cheese. I was pleased by how much cleaner this one was than some of the ones we used to go to. We have been there a few times and my kids really like it. It has games for all ages to play. The pizza is ok but I really love the salad bar for adults. It is a fun place for everyone. Overpriced for what you get in the pizza department but the kids love coming here. Generally we come for the games and the pizza is pretty much an afterthought. It's unfortunate that the price for the so-so pizza is as high as it is. All games are ONLY 1 token! Restaurant was clean n staff was very friendly.Ended up spending less then I usually do at Peter Piper! Great place for families with little one's. Took my kids there and had great time to my surprise.All games only one token,place was clean and staff friendly.Even the mouse came out and gave kids free tickets. Get quick answers from Chuck E Cheese's staff and past visitors.